Yeah, I got these about a year ago, but I figured I'd show them off here. Those are cool. I like em. They're nice! And what's their meaning? They must have some. 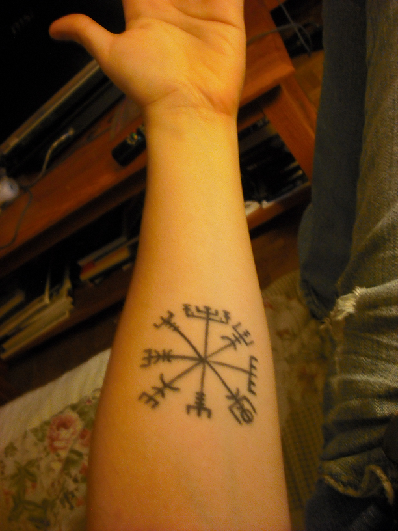 Gratulor would love and worship you for having Icelandic magic signs in your skin (he's from Iceland!) and besides, they look awesome as tattoos. A few years ago I painted them on plastic that I use as a keychain but now it's really tempting to go ahead and get those for myself as well. Also, the forearms are good places to have them made since in the ancient times, those were carved on stone and used to guide travelers through rough weather and to protect them from evil. How did you get that idea, Izzy? Also, the forearms are good places to have them made since in the ancient times, those were carved on stone and used to guide travelers through rough weather and to protect them from evil. For those very reasons, actually. About two years ago I had been researching old magic, specifically to find charms for protection against evil. I had looked up several sources, and eventually decided on using runes, not just because they're powerful (transcending time) but also because my father happens to be Breton, and I'm somewhat certain his lineage is linked to the Norse people. But that's a whole lot of conjecture based on a lot of things that most people do not believe in (including my own father), so I won't get into that. Furthermore, I've ... seen a lot of terrible things over the course of my very short life. Not to say that if I could redo things, that I would've avoided these experiences, because I wouldn't, but enough events have happened to me that necessitated (at least, in my mind) to bear protection charms permanently in my skin. Then again, I'm a really paranoid, spiritual, cynical, unlucky lucky person. I just feel better having them, safer somehow, and it feels good to wake up and see them there. This is my first tattoo. I got it when I was 18. I was young, big into ICP and Psychopathic Records and drew the design up in high school. Thus began my addiction into ink! This is my Lotus Cross tattoo. I got it when I turned 21. It's another ICP related tattoo. But, its a cross, too, so I can still just call it a Celtic cross or something. When I was 23, my Grandfather passed away so in my need of painful release, I opted to either get a tattoo or beat up a tree... Broken knckles and an E.R. bill or beautiful art? I went with these. Then this is my branding. My Star Wars tattoo. Got this as my 24th birthday present! No need to tell ya what it is 'cause if ya don't... You shouldn't even be in this thread let alone these boards. I can't wait for my next ink... Which'll probably be "If it ain' hard" on the outside of my right forearm, and "It ain't worth doin'" on the outside of my left forearm. They're all really awesome Dar, though I think my favorites are the two of either inner-arm (grandparents). Thanks! I'm really tempted to get the tattoo like Cade Skwaylker has on his left arm. Its the tribal lookin' design. 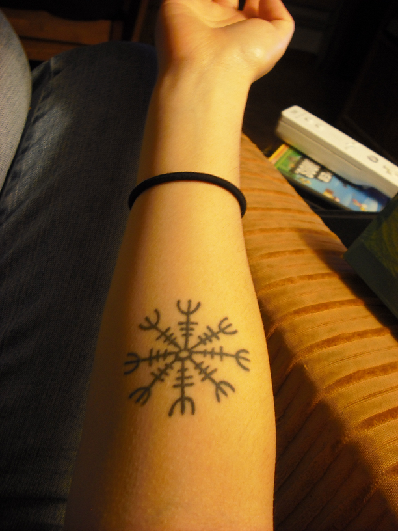 I think its pretty cool, and I want to eventually have tribal designs that covers my left arm 'cause it looks awesome to me.